E5515C -- a bench-top network emulation tool. AGILENT Technologies has announced comprehensive new tools for the Agilent E5515C (8960 Series 10) wireless communications test set. The E5515C with lab applications -- a bench-top network emulation tool -- provides an integrated solution with high accuracy and repeatability for R&D teams and chipset manufacturers testing multi-format wireless devices. These new tools expedite the chip, module, application and wireless-device development process, reducing cost and frustration by eliminating complex RF connections and unrepeatable calibrations. * The E6717A UMTS suite, which bundles lab applications for GPRS, EGPRS (EDGE), GSM and W-CDMA technologies into a single product costing less than individual formats. * The E6719B suite, which includes EGPRS (EDGE) functionality and GSM/GPRS, cdma2000 and W-CDMA technologies in a single product, also costing less than individual formats. * The E6703C W-CDMA lab application, which includes the Agilent-exclusive phase discontinuity graphical measurement. This helps expedite the verification of phase performance under changing power conditions to ensure wireless device reliability. * The E6701D GSM/GPRS lab application, which supports multimedia messaging service (MMS) testing and comprehensive adaptive multi-rate (AMR) capabilities. It also provides end-to-end video conferencing test with real-time audio/video and picture-in-picture. 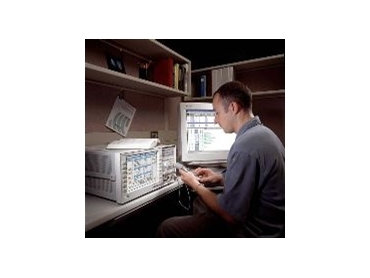 The Agilent E5515C lab applications include technology-specific Wireless Protocol Advisor (WPA) software, providing diagnostic tools that let designers view protocol layer messaging between the wireless device and the network. Wireless Test Manager (WTM) software, purchased separately, lets engineers develop and support their own automated test processes, expedite development of final test plans and calibration tests for wireless device production lines. The WTM software for cdma2000/IS-95/AMPS, W-CDMA and GSM/GPRS/EGPRS features the Visual Basic .NET development platform. The WPA and WTM software streamline the device's transition from development to production and reduce test support costs.